Schaumburg, Illinois: what comes to your mind? Why, shopping and highways, of course. Woodfield Mall! The Streets of Woodfield! IKEA! I-290 and I-90! Yes, this is a true edge city, one where almost limitless growth occurred during the second half of the twentieth century. Yet nature is not to be denied. Coexisting within this development are 2,475 acres of open landscape, which makes up about 20% of the land cover, according to the city’s Biodiversity Recovery Plan. These precious acres represent so much for so many — a place of beauty, recreation, leisure or solitude. But there’s more than meets the eye, for not only is this open space vital for humans, it’s essential for the planet. One critical element of this open space is wetlands. 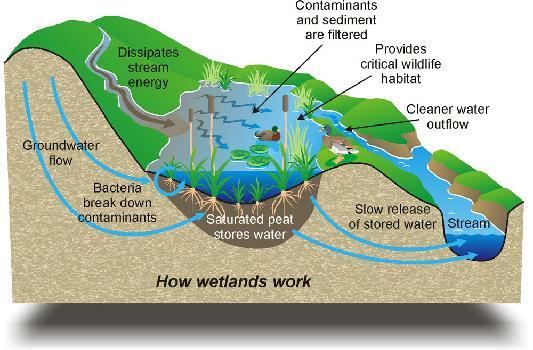 While hardly glamorous, wetlands play a crucial role in keeping our ground-and surface water cycled, clean, and stored. They also help mitigate floods. Unlike the vast parking lots and asphalt roads that dominate Schaumburg, which can’t absorb rainwater, wetlands act like a natural sponge. Water seeps into the ground, where certain nutrients filter out impurities, before the water is eventually cycled out. This symbiotic relationship is known as the hydrologic cycle, and is pictured in the diagram above. Furthermore, wetlands are necessary in promoting plant diversity. In a 2007 article from the journal Ecological Restoration, it was reported that researchers had studied 450 plant species in varying habitats throughout northeastern Illinois. They discovered that a wide variety of plant species were contained in wetlands, most likely due to the soil composition and fluctuating moisture content. In addition to the ecological benefits, wetlands also provide a habitat for all sorts of wildlife, including nesting and migratory birds. Wetlands truly are invaluable for the flora and fauna that call Schaumburg home. In the pre-settlement past, the Recovery Plan notes, wetlands covered more than 8 million acres of land in Illinois, yet over time, that number has dwindled by over 90 percent (as cited in Suloway & Hubbell, 1994). Today, wetlands account for only two percent of the land in Schaumburg, so it is extremely vital that this fraction of space is kept intact through conservation. Western Farm Press revealed that despite recent increasing efforts in wetland conservation, wetland loss has increased by a staggering 140% from the 1998-2004-time period to 2004-2009. One of the regions that suffered the highest losses was the Great Lakes region. According to the aforementioned Biodiversity Recovery Plan, what does remain of Schaumburg’s wetlands has been modified significantly. Surface runoff, instead of groundwater, now drives the water level, and without the control of fire, non-native species such as reed canary grass can take over. The most prevalent type of wetlands in the village are emergent (defined as permanently wet areas characterized by erect, rooted herbaceous wetland vegetation, such as cattail and bulrush); however, due to development, a vast majority of these wetlands are now just a monoculture of cattails. The report states, “Wetlands now serve as depressional storage areas and provide some water quality benefits, but have in large part lost their value as wildlife habitat” (pg. 8). In addition to the conservation needs of this area, it’s necessary to encourage proper restoration of these ecosystems, so that they not only survive, but also thrive. Despite these somewhat gloomy statistics, not all hope is lost. The first step in conservation is simply recognizing the importance of what you have before it slips away forever. Fortunately, when Schaumburg published their Recovery Plan, a framework was laid for preserving their ecological heritage. If we are serious about conservation and restoration, a few things must be kept in mind. The following guidelines are adapted from an article in Ecological Applications. First, there must be good communication regarding wetland function between all involved with the project; few ecologists have engineering expertise, while few engineers have a strong knowledge of ecology. Only when a perfect balance is struck can all parties move forward with their plans. It’s been said that more standard parameters need to be put in place to understand wetland conservation and mitigation, which is why these common-sense actions need to be in place prior to the start of a project. Wetlands in Schaumburg are too precious to destroy; and the future simply cannot be sustainable without them.